I put the final touches on Hell(Sack)Boy today including revised legs, shorts with a hole for his tail, decorative top stitching, and a cigar. I kind of liked him without the decorative stitches, but he’s cute this way, too. Sometimes, I amaze even myself. 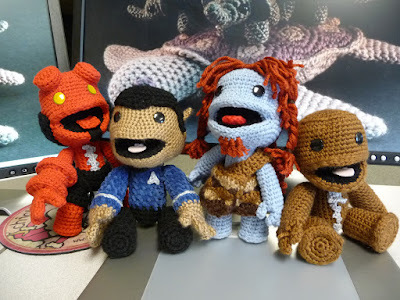 From left to right: Hellboy, Spock, Daft Wullie (a Nac Mac Feegle from Terry Pratchett’s Discworld books), and Sackboy Classic. Each of these custom dolls takes between 4-8 hours to make, and the average size is around 8-9″. 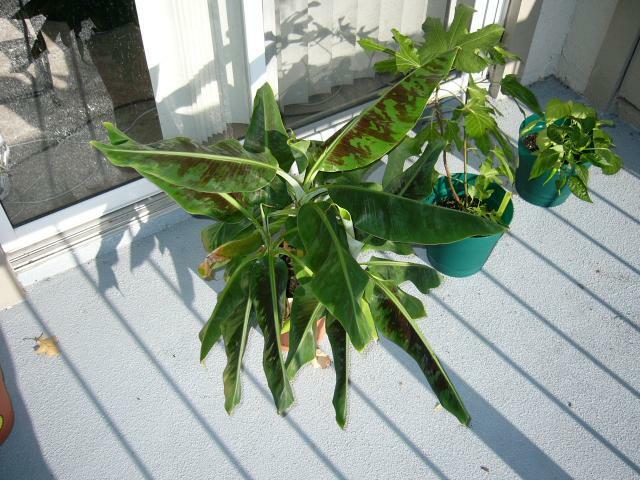 Once upon a time, I ordered a dwarf Cavendish banana plant from Park Seed on clearance for $4.95. It was cute. It had 6 little leaves poking out of a quart container. I put it in a bigger pot and moved it out to my apartment balcony with a southeast exposure. My lil’ Nana got bigger, but not too much bigger. Then I moved in my my boyfriend (now DH), and we bought a house together. I decided that my baby banana tree needed more room to grow. I transplanted it into the ground by the garage. It liked the Florida weather and sandy dirt a LOT. It is now over 10 feet tall and has sent up enough pups to make it around 5-6’ in diameter. The main tree is the one with the tallest leaves on the left. DH wants to chop it all down. I convinced him to hold off until we at least get some ripe bananas off of it. It’s got until mid-February or so, then DH will be going at it with a chainsaw. Let’s hope the bananas are ripe by then and not blackened by an unexpected frost, because there is enough to make a whole year’s worth of green smoothies. Down here in central Florida, it is already time to start our warm weather vegetable and flower seeds and to direct sow our cold weather vegetables. My indoor seedling nursery has not been set up yet, but I HAVE cleaned up the square foot garden, raked in more compost, and replanted with lots of leafy greens, stir fry peas, edamame, and my favorite, Bright Lights Swiss chard. I love watching the little green seedlings pop up out of the (temporarily) weed-free raised bed! It’s just as much fun as seeing the first indoor seedlings appear in their little peat pots. This spring I would like to try to successfully get a small container herb garden going as well as plant my usual variety of tomatoes, peppers, and eggplants again. Some heat-tolerant leafy greens like mustard and malabar spinach are also on the list…and I MIGHT risk some zucchini, even though I don’t have a ton of room for it. And while the Vardaman sweet potatoes are now firmly established and self-propagating (check out my mid-winter harvest below–and those are just from the volunteer vines I had to tear out of my raised bed, not the main patch! ), I want to order an assortment of end-of-season white sweet potato varieties from Sandhill Preservation Center to plant in June. Are you gardening yet in your part of the country, or just scanning the seed catalogs for this year’s must-have crops? What do you plan to grow this year? 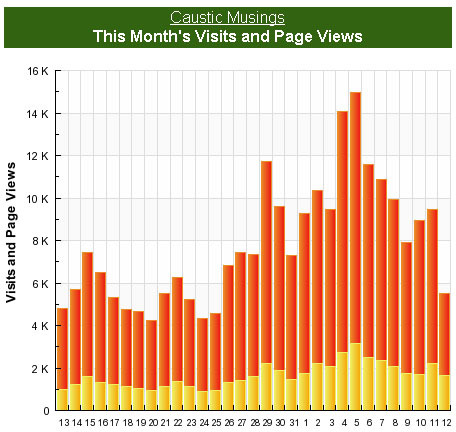 I’m going to be terribly ADHD this month and switch programs mid-month. I just got BeachBody’s ChaLEAN Extreme program (retail price $119.95) yesterday, and given how packed my gym has been this month and how little free time I have, the 30-minute workouts in the package are very appealing to me right now. Despite the admittedly goofy name, the program actually focuses on heavy strength training for 30 minutes three days per week in combination with more cardio-based workout sessions on off days to produce results. It also comes with a nutrition plan with 80+ moderate carb recipes divided into three phases to match with the three month-long workout phases of the program: Burn, Push, and Lean. Workout preferences for me are kind of cyclical, and at this time I am just not feeling motivated to do 60-minute workouts of any kind. This is killing my motivation to commit to another round of RCR-style circuit workouts, even if they ARE with heavier weights, and it’s also making a full cycle of P90X (which also runs 60 minutes per workout on average) really unappealing. Frankly, I’m unenthusiastic about my workouts this month, committed to a LOT of non-exercise projects and work, and ready to stop thinking so much about things and just go on autopilot for a couple of months. ChaLEAN Extreme looks like it is a step down from P90X in difficulty and intensity, but higher than the Turbo Jam, Hip Hop Abs, and Slim in Six BeachBody products. The lifting tempo appears to be slower than what is used in P90X, and the rep range is 10-12 reps for most exercises. Looking at the calendar, the workout schedule includes 3 strength circuit days, 2 interval style cardio days (one also includes ab work), and 2 rest days per week. I’m reinstating my lunch break walks at a minimum, with skating on days when I feel the urge and the weather is dry. I’ll start the ChaLEAN Extreme program with the fitness assessment and first Burn phase 1 workout tonight and schedule in the rest of the program in my workout journal. I have to finish reviewing the diet and workout schedule during my lunch break, but hey, I can do that while walking. 😉 If the diet seems reasonable, I will give it a go with some protein source substitutions to keep it more in line with my semi-vegetarian goals for this year. “Muscle Burns Fat™” Guidebook – This is a printed book, not a digital file, and contains an overview of the program, the reasoning behind its design, lots of convincing verbiage about the importance of lifting heavy weights to build muscle which will in turn burn fat, motivating before and after photos of the most dramatic transformations from the program’s test group, workout calendars showing exactly which workouts to perform for the three transformation phases of the program and the ongoing maintenance phase, pages for your progress photos and stats, and exercise descriptions and photos. Fat Calipers – These come with an instruction card printed with male and female charts for determining body fat from a single suprailiac skinfold. Thigh Toner Band – Looks like a giant flat rubber band about 6″ wide. I’ve seen similar items sold in the pilates section of Target. Chalene’s Personal Motivational Audio CD – More explanation about how Chalene Johnson came to design this program as she hit her mid-30s and discovered that her body was changing — heavy cardio-style workouts were not enough and building muscle became key to keeping her metabolism fired up. Also includes motivational “You can do it!” messages, a list of behaviors that fit people exhibit, and strategies and tips for getting past roadblocks. “Healthy Eats” and Kitchen Makeover DVD (on the same DVD as the workout instruction videos) – Tips and techniques for cleaning up your eating and kitchen as well as low-key ways to eat on plan at any restaurant. The DVD folio, Muscle Burns Fat guidebook, and Fat Burning Food Guide all fit into a handy cardboard slipcase to keep everything tidy and in one place. Additional equipment needed for the workouts is pretty basic: Pairs of 5-30 pound dumbbells for women and 12-40 pound dumbbells for men, or the equivalent in resistance tubing (the kind with handles). I’ll be using my adjustable Powerblock dumbbells, and the folks in the videos appear to be using Bowflex SelectTech adjustable dumbbells. Since the instruction video didn’t show anyone doing pull-ups or chin-ups as they do in P90X, I’m assuming that this program does not integrate those exercises. I’ll get my starting stats this weekend and post my impressions of the Burn phase of the program as I complete each workout this week. Stay tuned this week as I kick off a recap of ALL the fitness programs I have tested out in the past 5 years and let you know which ones I recommend for different goals, budgets, and personality types. So I was approached by a co-worker recently who was aware of my minor obsession with making Sackboy dolls from the PS3 game, Little Big Planet. Well, this co-worker wanted a Sackboy, too, but not just any basic old Sackboy. She wanted one dressed like Mr. Spock from Star Trek.